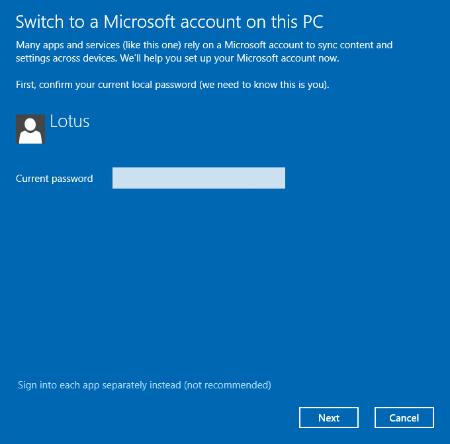 Why Should I Bother with a Microsoft Account for Windows 10? Introduced with Windows 8, the Microsoft account is simply an e-mail address and password that lets you access Microsoft’s services. You don’t need a Microsoft account to use any version of Windows. But eventually, you’ll run across the figure shown below, asking for you to sign in with a Microsoft account. You can always click Cancel to back out of that window. But when you begin using a Microsoft account, your computing world suddenly becomes a little bit easier in several ways. Here are just a few ways a Microsoft account comes in handy. When you log in with a Microsoft account, Windows remembers your settings. So, when you log onto a new PC, it begins to behave a little like your old PC: You automatically see your same wallpaper and colors. The Start menu’s tiles are rearranged the way you like. Your browser history, favorites, and passwords travel with you, and you can quickly find your apps in the Windows Store. To adjust which settings should travel with your Microsoft account, click Windows 10’s Start button, and choose Settings. When the Settings app appears, click Accounts, and choose Sync Your Settings from the Accounts’ window’s left pane. There, you can flip toggle switches for the settings you’d like to stay with your account. Your Microsoft account gives you access to 15GB of free storage space on the Internet. And you can access those files from any web browser, PC, smartphone or tablet. Whenever you’re in range of a WiFi connection, you’re within range of your favorite files. If you need to collaborate on a group project, you can also share a OneDrive folder that everybody can access. The new Windows 10 Microsoft Family system lets you monitor or control your child’s computing activity. When your child has a Microsoft account, he’s subject to whatever controls you place on his computing behavior, no matter what device he uses to log in. Each week, you can receive a report on his computing activities. Instead of plugging your phone into your computer to retrieve photos, just install OneDrive and turn on the Camera Roll feature. Your phone then automatically uploads its photos to OneDrive whenever you log into a WiFi connection. That lets you view photos from your phone or tablet from anywhere, sparing you the hassle of transferring them manually. No, you don’t need a Microsoft account to use Windows 10. But you’ll get a lot more out of Windows 10 if you do.